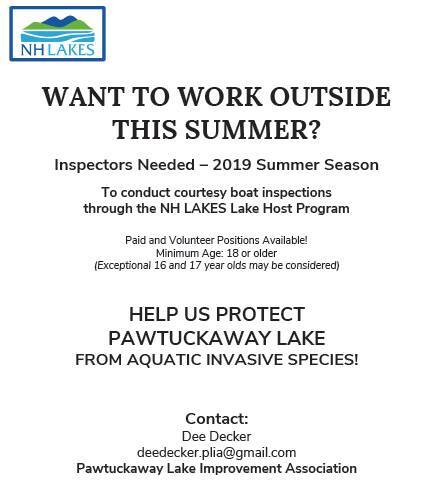 Local opportunity at Pawtuckaway Lake for high school & college students, teachers, retirees, or anyone who likes to work outside. Email Dee Decker for more information. Is the Ice on the lake safe Yet? 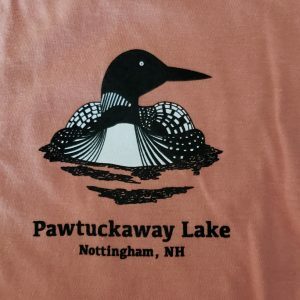 You may be seeing ice fisherman on parts of Pawtuckaway Lake, but there is still a lot of open water, and that could spell danger for anyone venturing out. Please never go on the ice alone, and always check the thickness before you step on it. Remember, ice thickness can vary from location to location, so always keep checking! Temperatures this season have varied wildly, with snow, rain, thawing and freezing weather creating dangerous conditions on the ice. Ice can be thick, but not strong, because of varying weather conditions. Weak ice is formed when warming trends break down ice, then the slushy surface re-freezes. 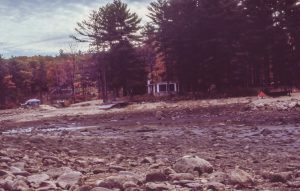 The New Hampshire Fish and Game Department has a very helpful booklet regarding ice safety and you can read it by clicking here. To all our winter sports enthusiasts: Safety first! Leave a comment on Is the Ice on the lake safe Yet? For a limited time only, the PLIA is offering its short sleeve T-shirts for sale during this holiday season. Rolled up, they would make great stocking stuffers! At $20 apiece, these keepsakes are perfect gifts for anyone who loves the lake. There are three styles, five colors, and they come in sizes S, M, L, and XL (while supplies last, that is). The ring T-shirt, pictured to the left, is white with navy bands around neck and sleeves. It comes with the loon logo or one of the other logos below. Colors are grey, light blue, yellow, salmon, and white with ring. Please order your T’s by emailing a message to Dee Decker at deedecker.plia@gmail.com. These are for pick up only! And…See you on the lake; maybe even on ice skates if we’re lucky! 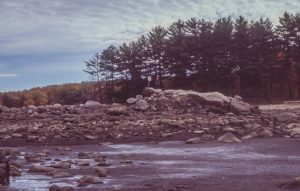 Background: Dolloff Dam is at least 176 years old as of 2018, according to a survey conducted by the Army Corps of Engineers in 1978. Over the years it has seen many improvements and repairs. 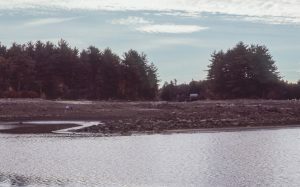 The stoplog section was added to the dam in 1956 in place of a gated outlet at the same time the spillway was enlarged. In 1964, its upstream side was resurfaced with concrete and in 1970 a concrete walkway was built. 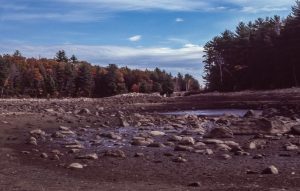 In 1974, the dam was again rehabilitated and the stoplog section was reconstructed. Forward to more recent times: By 1985, further repairs had become necessary. 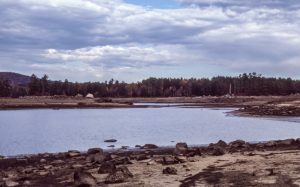 In order to conduct the repairs, the level of water in Pawtuckaway Lake had to be dropped drastically so that work could be accomplished on dry land. 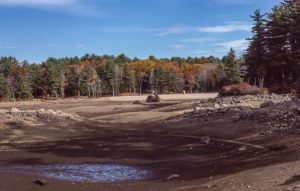 In the fall of that year, therefore, the usual drawdown of the lake continued until most of the water was drained off by October. 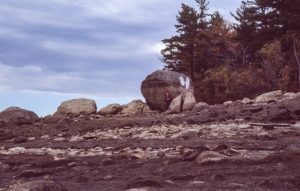 This left an eerie landscape that was captured in photographs by former Pawtuckaway resident George Robinson, among others. George offered his photos to the Nottingham Historical Society and member John Bartsch transferred the images from slides to digital pictures. Courtesy of George, John, and the Nottingham Historical Society, we are pleased to be able to share this wonderful view into the past with the visitors to our website. Enjoy! For those of you who may have your own memories of this historic event, we would love to hear from you. 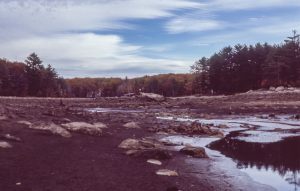 Needless to say, if you have photos of the lake during or after it was drained that you would be willing to share as well, we will be delighted to post them on the website. 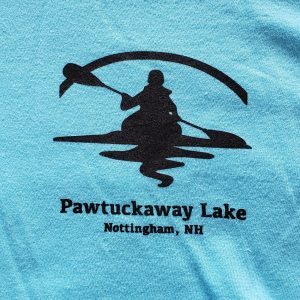 Just send us an email at: Info@PawtuckawayLake.com and if applicable, attach your pictures. 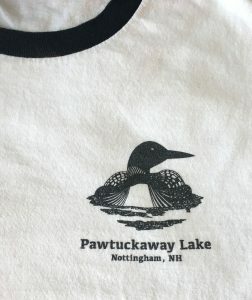 Maybe we can create a new Photo Gallery to add to our permanent collection of photographs of Pawtuckaway Lake on this website. And thanks! It’s getting to be that time of year when thoughts turn to taking bigger boats out of the lake. Yes, it’s fall, folks, and we have to make plans for the coming winter. 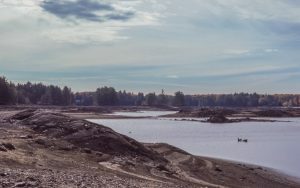 Wondering when the Dam Bureau will start its annual drawdown of the lake level? According to the NH DES website, it will begin this year on October 15th. You can consult the State’s list yourself by clicking here. 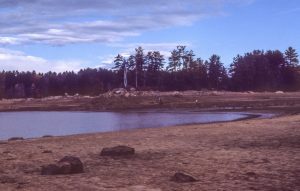 This website has an informative page all about lake conditions. You are invited to check it out! In the fall the lake is still an inviting place to explore with kayaks, canoes, jet skis, and paddle boards, even as the water level drops. Just watch out for those rocks! 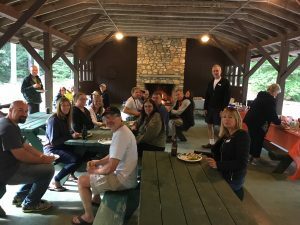 A lively crowd of PLIA volunteers gathered on Sunday, September 23, for a cookout at the pavilion in the State Park. The PLIA recognizes that the many programs it sponsors would be impossible without the dedication and good will of the people who freely donate their time to the work of this organization. 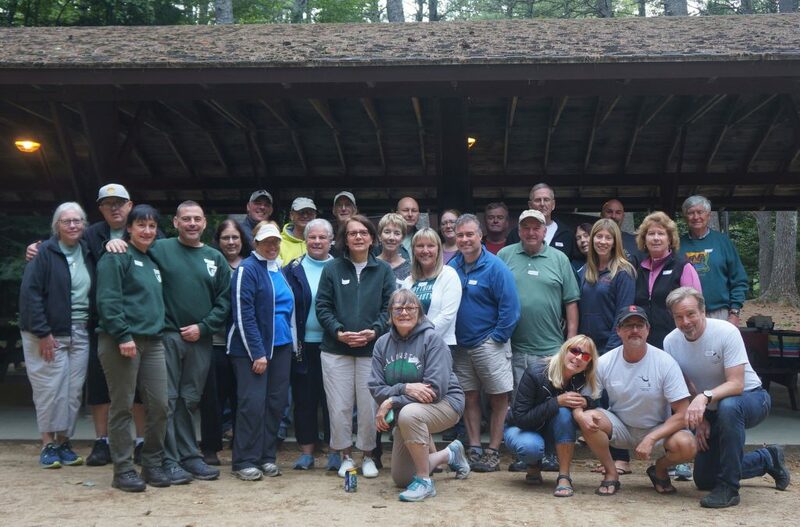 It is true that “Volunteers don’t get paid, not because they’re worthless, but because they’re priceless.” This group is no exception, and their efforts to keep Pawtuckaway Lake clean and safe for the enjoyment of the public are invaluable. 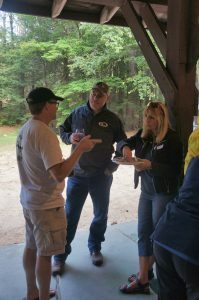 Represented were members of many programs: Weed Watchers, Lake Hosts, Milfoil Team, Road Representatives, Island Adopters, Road Cleanup, and Water Testing. Together they make the PLIA a strong and vital organization. Please join us in saying, Thank You! 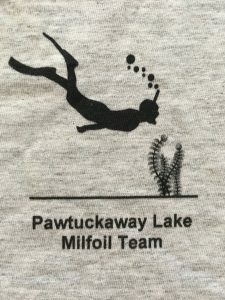 If you have been reading about Neil Santos and the new PLIA Program he is heading—as well as the discovery of new milfoil growths in Gove’s Cove—then you know how important it is for everyone who loves Pawtuckaway Lake to pitch in wherever they can in our campaign to eradicate milfoil. Neil is looking for volunteers who like to snorkel and can join his team from time to time as they make their surveys to locate and mark milfoil in the lake. It’s OK if you can’t snorkel with Neil every time his team goes out—now and again would be helpful as the need for more surveys grows. They normally go out for about 1 1/2 hours and are flexible about the time and day of the week. If you have some experience with snorkeling, have a mask, snorkel, and fins and are interested, please consider joining the team. If you are a diver, your assistance would be particularly valuable. Even though the team has dubbed itself “Men in Black” since they look for alien species and sometimes wear black wetsuits, women are more than welcome to join. Please contact Neil Santos at 603 437-8468 or at neilsantos@comcast.net if you would like more information or would like to volunteer. 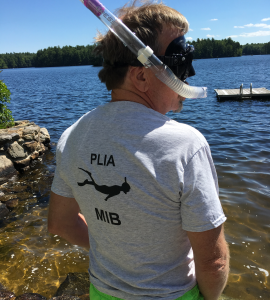 Volunteer Neil Santos created a milfoil snorkel patrol a couple of years ago in response to the variable milfoil infestation on Pawtuckaway Lake. 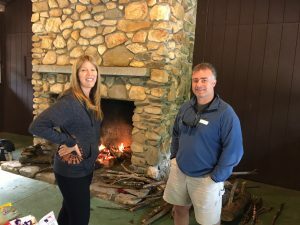 Since then, for his work he has received the Cox Conserves Hero Award and his team has grown to include a certified milfoil SCUBA diver, volunteer Tim Roos. Because the work of this team has developed a very specific purpose and its focus remains on milfoil, Neil’s mission has expanded beyond weed watching. 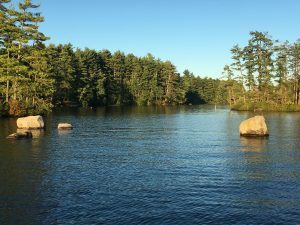 Mid-Summer Milfoil Update. As most of you probably know, we have had variable milfoil in the South Channel for the past three years. This year we have continued to find it in the same general areas of the South Channel. The plants have, in general, been smaller than in past years and most are probably regrowths from previous plants that were not totally eradicated. It is very tough to get all the roots so the plants do not regrow. 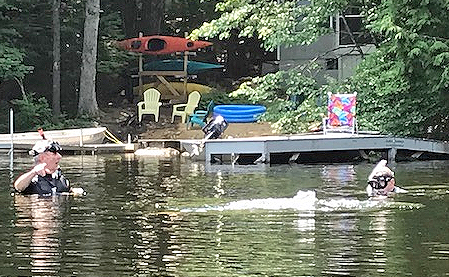 The good news is that none have been close enough to the surface to be fragmented by props or other surface disturbances and all have been removed by our newly certified milfoil diver, Tim Roos. 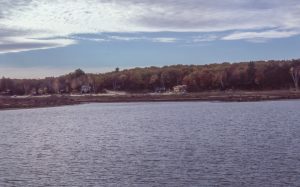 The unfortunate news is that a lake resident, Shane Pelletier, noticed milfoil growing in Goves Cove, near the dike. That plant was probably a couple of years old but has now been removed. It is probably the result of milfoil carried there by a boat prop or fishing tackle. No other plants have been found in Goves Cove but we will be keeping an eye on that area. A homeowner and boater on Gove’s Cove called in a suspicious underwater growth there. Within 17 minutes, a member of the Weed Watchers checked it out. 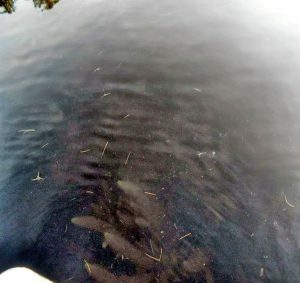 Within five hours, Amy Smagula at NH Department of Environmental Services verified the photo as most likely Milfoil. Within 24 hours, the Milfoil Management Team snorkeled and confirmed the diagnosis, then placed boat warning signs on the growth. 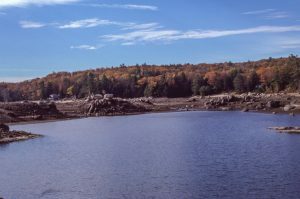 In the following week Amy visited the site, NH DES divers removed significant parts of the growth, and the Milfoil Team surveyed the location. This is a wake-up call for all of us! Amy indicated that this milfoil infestation had likely been there for two years. The bottom line: if you swim, boat, kayak, paddle board, fish, canoe, live on the shores of the lake, or garden on the shoreline, your eyes are critical to early detection. As the saying goes, IF YOU SEE SOMETHING, SAY SOMETHING. The homeowner did exactly that. He noticed something new and different in his cove. He called it in!! I will train anyone and everyone on becoming a Weed Watcher. I can do it in about an hour. You can come to my home or I will go to yours. Steve Soreff, Co-Captain Pawtuckaway Lake Weed Watchers, a program of the PLIA. Email soreffs15@aol.com or call home 603 895-6120 or mobile 603 568-3202. Hope to see you real soon!!! 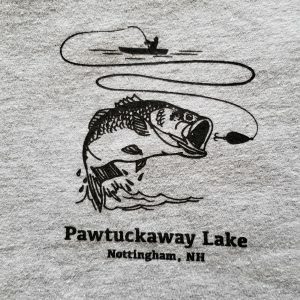 Let’s all SEE SOMETHING and DO SOMETHING to protect Pawtuckaway Lake. 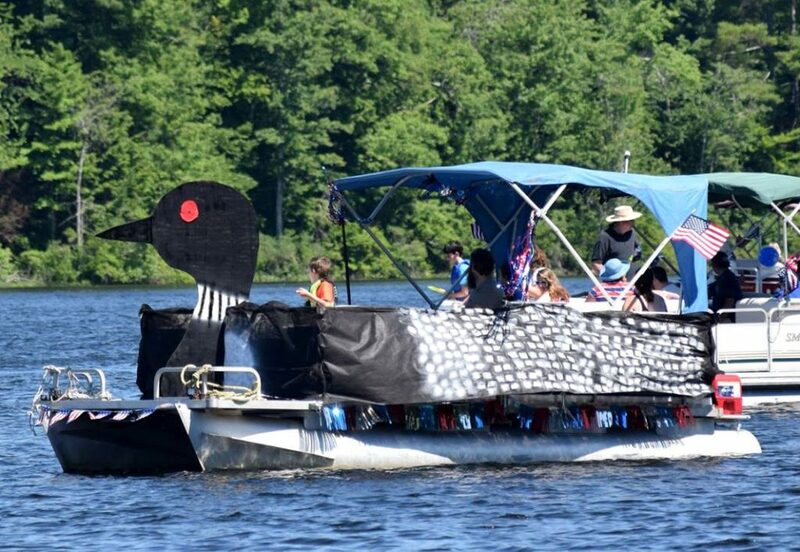 Every year, to celebrate our nation’s birthday, the PLIA organizes a boat parade around Pawtuckaway Lake on July 4th. 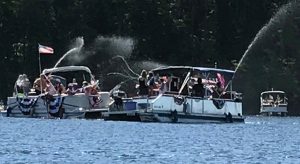 People decorate all kinds of boats – from pontoons to kayaks to power boats to jet skis – with patriotic or fanciful themes, and congregate at the north end of the lake for our annual parade. This year is no exception. 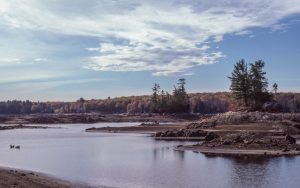 At 10:00 AM boats gather at the north end near the Twin Islands, proceed southward in a clockwise direction at 10:30 AM, and then cruise slowly in a circle around the lake as boats fall in line behind the leader. So, haul those decorations, flags, and banners out of storage, and make your watercraft colorful and eye-popping this year. And – see you on the lake!